Do you plan to exhibit at international trade shows in 2018? Trade shows and other export expansion events provide an opportunity to grow your business in new markets and drive higher global revenues. They diversify your client base, and can serve as a launching point for sustained international success. The world’s leading businesses use trade shows as an opportunity to build brand awareness and drive sales in underdeveloped, high-potential markets. Canadian businesses are fortunate when it comes to participating in export trade shows, since government funding is available to offset up to 50% of trade show expenses. Top export development grants include CanExport and Export Market Access (EMA). These programs are vital to being proactive with export market development, since they can strategically reduce the costs of booth rental, travel and accommodation, and even the translation of marketing materials. To help you get started with government funding-assisted trade show participation, we’ve pooled together top export resources and trade shows within this article. Feel free to browse the resources included, or simply skip to your business’ sector to find the top trade shows to participate in during Q1 and Q2 2018. Businesses should begin the process of finding and evaluating trade shows by determining their ultimate objective of export expansion projects. Is brand exposure the main objective? Establishing contacts to support new sales? Understanding what outcome you’re wanting to achieve will shape the selection of events you wish to attend. The trade calendars for Ontario and Canada can be a great place for new exporters and smaller businesses to start their exploration of trade shows and educational resources. As a leading directory for trade shows and conferences, 10times provides excellent insight into global growth opportunities your business. Users can search for top export marketing opportunities within a few seconds, providing excellent visibility into the full range of events you may wish to participate in. Website visitors can search for trade shows and conferences by city, country, industry, or event name to gain greater insight into those events most important to their business’ success. 10times also maintains tailored lists of the 100 top trade shows in a particular country or industry segment. For example, businesses can easily search for the top 100 American trade shows, and the top 100 manufacturing and fabrication trade shows. Events in America is one of the most comprehensive databases of professional events and trade shows in the United States, and also lists many Canadian-based trade shows too. Business leaders can use the site to quickly look up trade shows by name, industry, or keyword (such as technology). 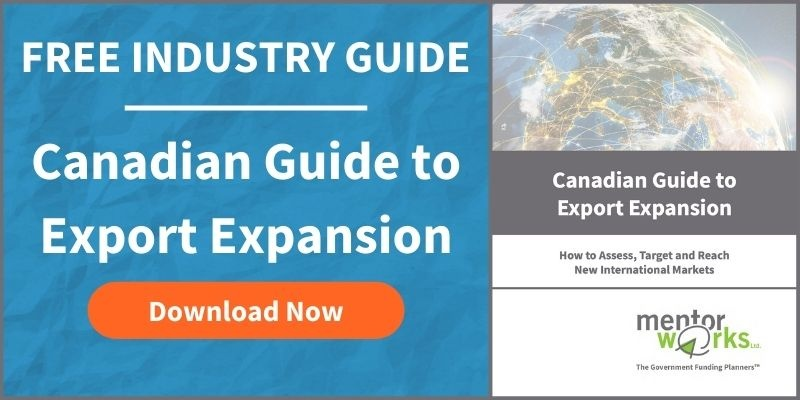 This reveals an extensive listing of trade shows and events that are targeted towards Canada’s top trading partner, and helps to remain focused on the events most likely to spur your success south of the border. One of the greatest benefits of using Events in America is that it saves much of the time needed to evaluate the market potential for USA-based trade shows. Instead of having to search for past attendee and exhibitor counts, Events in America lists these (for most events) which helps to identify large, well-known events, and prioritize these over smaller, niche-based economic events. Although we advise performing your own research into top exporting events, we’ve used the three resources listed above to curate a tailored selection of international trade shows worth participating in during the first and second quarter of 2018. Consider the following trade shows when developing your business’ 2018 exporting plans. Don’t forget, Canadian businesses can offset up to 50% of trade show expenses through government funding for exporting. Consider applying for programs such as CanExport and Export Market Access for government grants to reduce project costs. Explore Trade Shows by Industry: Use the following hyperlinks to jump to trade shows for your industry. (Istanbul, Turkey) The Eurasia Glass Fair brings together leading manufacturers and decision makers of the industrial glass products, glass production technologies, tampered glass, glass production machinery, glass processing machinery, tempered glass, flat glass, and laminated glass industries. (Anaheim, CA, United States of America) Natural Products Expo West is the world’s largest natural, organic and healthy products event. It’s the preeminent show for spotting trends in the food and consumer packaged goods (CPG) industry, attended by industry pioneers and a new generation of innovators shaping the future of healthy products. (Austin, TX, United States of America) South by Southwest (SXSW) is an annual conglomerate of interactive media, technology, film, and music festivals and conferences. Its trade show component highlights the integrations and overlaps between SXSW’s converging industries, hosting a diverse range of forward-thinking exhibitors ranging from promising startups to established industry leaders. (Istanbul, Turkey) WIN Eurasia will provide exhibitors and visitors the unique opportunity to showcase and experience the entire manufacturing industry. From sheet metal processing to metal forming technologies, automation services to electric and electronic equipment, and hydraulic & pneumatic services to intralogistics, WIN EURASIA 2018 will be bringing all the ecosystem needed for the future’s factories. (Bologna, Italy) Cosmopack is the leading international event focused on packaging design, contract manufacturing, raw materials, machinery and all services for the cosmetic industry. The creative content and innovative products exhibited make this fair a unique event. (Guangzhou, China) Interzum Guangzhou is Asia’s largest and most influential furniture production and woodworking trade fair. The event is a sourcing platform for the furniture production industry; if you wish to sell into the Asian market, then this is an excellent opportunity to make new contacts and develop and refine your expansion strategy. (Hannover, Germany) Hannover Messe is the world’s leading industrial show. It combines five trade fairs to provide a comprehensive look at industrial innovation areas, including energy, research and technology, and industrial supply. Get to know groundbreaking technologies, benefit from valuable synergies, and launch new projects – all in one place. (São Paulo, Brazil) The International Trade Fair for Mechanics and Integrated Manufacturing Systems is one of the biggest global machinery and equipment trade fairs. It presents the entire spectrum of innovations in the machinery and tooling sector, and will be one of the year’s most important and crucial meeting place for industrial equipment buyers and sellers. (Abu Dhabi, United Arab Emirates) The International Aviation Exhibition in the Middle East brings together major players in aviation, enabling a demanding clientele to discover the industry’s latest developments and innovations. This exhibition is designed for professionals and private owners, and offers visitors a wide and representative range of the ever-growing aviation industry. (Seattle, WA, United States of America) The fourth annual Aerospace and Defense Supplier Summit Seattle is a supply chain conference and networking event that brings together aerospace and defense companies, tier suppliers and contract-manufacturers. Engineering, procurement, supply chain, fabrication, commodity teams, suppliers and service providers will meet through pre-arranged one-on-one meetings. Note: This event does not have a trade show component, however, elements of your involvement can still be funded through government grants. (Nashville, TN, United States of America) The AAAA Annual Summit is an opportunity for the army and aviation community to gather and focus solely on army aviation. It provides access to key decision makers, like aviation project/product managers to reach new customers and strengthen existing relationships within the American aviation industry. (Berlin, Germany) The Innovation and Leadership in Aerospace (ILA) Berlin conference is the most innovative trade event for international companies to attend. During the event, you will receive a unique opportunity to network with key stakeholders from around the world, find the perfect marketplace for the supplier industry, discuss the key issues of the future with experts, introduce your company to recruit aerospace professionals, and marvel at the impressive innovations on display. (Farnborough, United Kingdom) The Farnborough International Airshow provides a platform to showcase aerospace technology with company exhibits, product briefings, conferences and demonstrations. This is an opportunity to showcase both military and commercial aircraft technologies. (Hannover, Germany) The Tire Technology Expo exhibits equipment and materials covering the complete spectrum of tire manufacturing. This includes, but is not limited to tire component making systems, tire building machines, tire building machine tooling, synthetic rubber, self lubricating bearings, rubber testing equipment, and rubber mixing technology. (Beijing, China) The Auto Maintenance & Repair Expo is an annual trade show that focused on automotive maintenance and repair equipment, tools, car care products, and consumables. It is a top international trade event for companies looking to access the Chinese market, as it provides exceptional opportunities to meet with Chinese manufacturers and offers a platform to evaluate the Chinese market. (Istanbul, Turkey) Automechanika Istanbul is Eurasia’s number one OEM and aftermarket event. It brings together professionals from the automotive manufacturing, distribution and repair sectors and provides opportunities for small and medium-sized enterprises to step up in the market. This event showcases products like components and parts, electronic products and goods, electronic systems and services, accessories and tuning services, and repair services. (Detroit, MI, United States of America) The SAE World Congress Experience (WCX) is a full-sensory event experience that immerses you in the forefront of the automotive and mobility industries. By exhibiting at WCX, you’ll put your products, services, and innovations in front of the most curious, forward-thinking minds of the global mobility industry. (São Paulo, Brazil) The International Trade Fair for Autoparts, Equipments and Services is the main event in Latin America focused on the Automotive Aftermarket industry. The trade show provides dealers, shopkeepers, wholesalers, and retailers direct contact with industry representatives to facilitate networking, product demonstrations, and new releases. (Dubai, United Arab Emirates) Middle East Electricity offers its exhibitors access to thousands of potential customers from across the Middle East, Africa and the rest of the world. As the region’s leading gathering of power industry professionals, electricity technology companies can expect to find new customers, strengthen relationships with existing clients and develop or expand their business in the Middle East and Africa (MEA). (Istanbul, Turkey) The Solar Energy and Technologies Fair (SOLAREX Istanbul) is a meeting point for Europe’s leading minds in solar energy technology development. The world’s solar energy sector CEOs, senior managers, purchasing directors, manufacturers, consumers take part in this trade show, making it an excellent opportunity to fuel your European expansion. (Houston, TX, United States of America) The Offshore Technology Conference (OTC) is where energy professionals meet to exchange ideas and opinions to advance scientific and technical knowledge for offshore resources and environmental matters. Trade show exhibitors include innovative technology developers capable of driving change in oil and gas sectors. (Chicago, IL, United States of America) Professionals from all over the world attend WINDPOWER to network, learn, advance their organizational mission and to participate in the largest wind energy exhibition in the Western Hemisphere. Trade show exhibitors will be able to access a network of innovators, thought leaders, and policy makers comprising America’s clean energy industry. (São Paulo, Brazil) The EnerSolar + Brasil – International Fair of Technologies for Solar Energy features the latest technologies, products, and services for the sector of sustainable, renewable and clean energy. It’s the ideal opportunity to launch products and services, as well as prospect and position your brand to the entire production chain of the segments of Solar and Wind Energy, Biomass, GTDC and the similar areas. (Nuremberg, Germany) Power Conversion and Intelligent Motion (PCIM) Europe is the international leading exhibition for Power Electronics, Intelligent Motion, Renewable Energy and Energy Management. It’s a technology forum for the whole value chain of the power electronics industry, from the components to the intelligent system. (Atlanta, GA, United States of America) The International Poultry Production & Processing Expo focuses on bringing together buyers and sellers of the latest technology of products and services to make your business successful. It’s the world’s largest annual poultry, meat and feed industry event of its kind. A wide range of international decision-makers attend this annual event to network and become informed on latest technological developments and issues facing the industry. (Dubai, United Arab Emirates) Gulfood is one of the world’s largest annual food events, serving one of the fastest growing sectors on the planet. Now in its 23rd year, Gulfood will once again welcome F&B professionals from all corners of the globe to meet for 5 days of business within this central hub for international trade and commerce. Global prices are set here, and it is from this foundation that your business can grow and access new international opportunities. (Paris, France) The Paris International Agricultural Show is one of the world’s leading agricultural events. The show is organized into four sections, including areas specifically for livestock production, crops and plants, gardening and vegetable gardens, agri-food products, and agricultural services/professions. (Düsseldorf, Germany) ProWein is the world’s leading trade fair for wine and spirits, the largest industry meeting for professionals from viticulture, production, trade and gastronomy. Trade show visitors come from highly relevant market segments and are typically the decision makers of their firms. It’s this quality of the visitors that has given ProWein its reputation of being a unique business platform. (Las Vegas, NV, United States of America) The Nightclub & Bar Show is the United States’ most influential gathering of bar and nightlife professionals. The event will provide your company an environment for connecting with the most influential buyers in the bar, nightlife and hospitality industry, seeking out new technology, products and services to make their businesses more productive and profitable. (Parma, Italy) Since 1985, CIBUS has been the true reference event for Italy’s agri-food industry. It gives high international visibility to seminars and round tables focusing on current topics related to food and retail. Although the event is highly Italian-focused, international products and businesses are also accepted to participate and exhibit at CIBUS’ trade show. (Shanghai, China) SIAL China sets the benchmark for overseas companies stepping into Asia and China as well as providing valuable market insights, trends and innovations of the regional food industry. It is a preeminent event for major market players in retail, hotel/restaurant/catering, food services, and manufacturing industries. (São Paulo, Brazil) The Fispal Food Service Trade Show brings together thousands of food service professionals as well as sector distributors and store owners. It showcases products like sorting, cleaning and milling machines, food processing and packaging machines and technologies, dairy products and technologies, and processed agri-food products. (Dubai, United Arab Emirates) Arab Health is the largest gathering of healthcare and trade professionals in the Middle East and North Africa (MENA) region. It provides updates and insights into cutting edge technologies, procedures, techniques and skills necessary to advance the healthcare industry. (Anaheim, CA, United States of America) Medical Design & Manufacturing West helps take medical devices from concept to market by uniting cutting-edge technology with the industry’s foremost minds. The show sources the world’s largest collection of suppliers of medical technologies and innovators. (Dubai, United Arab Emirates) The Dubai Pharmaceutical & Technologies Exhibition serves as the convergence point for pharmacists, physicians, scientists, researchers, paramedical professionals, drug developers, manufacturers, distributors, and other key decision makers from across the medical profession. (Bologna, Italy) Cosmofarma is the pharmacy world’s leading European event for the Health Care and Beauty Care sectors and all pharmacy-related services. Its 150 hours of conventions, conferences and ECM courses, represents an exceptional opportunity for up-to-the-minute professional training, interaction and discussion that cannot be missed in the current climate of constantly developing regulations and policies. (São Paulo, Brazil) The Hospitalar Fair and Forum is and international event for solutions, products, services, technology, and equipment for the healthcare sector. It brings together hospital leaders and health professionals, and health thinkers together to discuss directions and trends in business management of healthcare. (Las Vegas, NV, United States of America) CES is the launch pad for new innovations and technologies that have changed the world. It is the world’s gathering place for all who thrive on the business of consumer technologies and it’s where next-generation innovations are introduced to the marketplace. The trade show component includes manufacturers, developers, and suppliers of consumer technology hardware. (Munich, Germany) The Internet World Trade Fair is a trade show and conference designated to promote the development of innovative internet technologies and services. It has a particular focus on e-commerce technologies, including logistics, e-payment, usability, online marketing, social media, and various software applications. (Pragati Maidan, India) Convergence India showcases the latest trends and technologies related to telecoms, broadcasting, cable and satellite TV, cloud and big data technologies, IoT, digital homes, mobile devices, film and radio, and content creation. It provides engagement with digital innovators, international business leaders, telecom and broadcasting executives, and other professionals from the technology, Internet and IoT industries. (São Paulo, Brazil) Ciab FEBRABANis the meeting point for professionals to discuss disruptive technologies, digital systems, and the future of the financial system. It also provides a unique opportunity for expanding networking and partnerships. (Austin, TX, United States of America) The Design Automation Conference (DAC) is recognized as the premier conference for design and automation of electronic systems. DAC offers outstanding training, education, exhibits and superb networking opportunities for designers, researchers, tool developers and vendors. Accessing government funding for trade shows is essential to maximize your export marketing efforts. By applying for government grants, companies can reduce trade show costs such as travel, lodging, booth rental, and marketing material translation. When used strategically, these funds can greatly improve the impact of your next trade show. One of the funding programs your business may be able to use is CanExport. CanExport is a Canadian government grant designed to support the export marketing and international expansion activities of up to 1,000 businesses per year. Amount: Up to 50% of eligible expenses or $10,000-99,999 in cost matching funds per year. Projects: Marketing activities in export markets not sold to in the last 24 months, including one trade show, translation costs, marketing, market research, & related costs. Timeline: One project open at any one time. Can apply for funding year-round. Eligibility: 1+ years incorporated, 1-250 people on payroll, $200k-50M in annual, taxed revenues, and not in the food industry. Similar to CanExport, Export Market Access (EMA) provides government grants for trade show participation. However, only Ontario-based business can apply and there are other subtle differences, including a smaller potential contribution and higher number of trade shows that can be included per application. Amount: Max of $30k non-repayable or 50% of project. Can include up to three trade shows per application. Projects: Participating in foreign tradeshows, developing marketing materials for new markets, and receiving product certifications to sell goods in international countries. Timeline: Must allow 30 business days for approval prior to first payment of booth rental or air fare expenses. Can apply year-round. Eligibility: Ontario-based company with 5-500 people on payroll, >$500k in revenues and 2 years incorporated. When applying for government funding, businesses must keep in mind that it can take up to a month or longer to prepare a detailed application that fully and accurately demonstrates your business’ strategic exporting opportunity. Furthermore, review of these applications can take several weeks to several months. After this time, a business may be formally approved for funding, and can begin making project spends. To receive Canadian government funding for trade shows in early 2018, it’s recommended that businesses begin the research and application process as soon as possible. To learn more about funding and get started with the application process, please contact Mentor Works. This post originally appeared on Mentor Works. Mentor Works helps established for-profit companies find and leverage Canadian business grants and loans. This week, Google announced “Pixel Buds” — wireless headphones that can translate 40 languages on the fly. It’s impressive, but most translators don’t worry for their jobs any time soon. In Douglas Adams’ “Hitchhikers Guide To The Galaxy” series, a Babel Fish is a small yellow fish that will automatically translate any language in the universe for you if you shove it in your ear. But on Wednesday, Adams’ fantastical idea took a step closer to reality when Google announced the “Pixel Buds”— a pair of wireless headphones that have Google Translate software built in, capable of translating 40 different languages as they’re spoken to you. So should professional translators and interpreters start getting freaking out about artificial intelligence (AI) stealing their jobs? Business Insider asked a handful of people working in the field for their thoughts. The verdict: While the tech is exciting, and has obvious consumer applications, they’re not worried. It sounds like jibberish, but it does make sense — if you’re familiar with jargon used in the oil and gas industry. A professional translator or interpreter with knowledge of the subject will be able to parse it and convert it into another language while retaining its meaning — while translation software would likely render it nonsensical. “Any legit professional will tell you that no matter how much the technology evolves, there’s simply no way for it to replace a translator or an interpreter due to several issues, the major ones being sentiency and abstraction,” said João Correia, a professional Portugese translator. It’s an attitude that others echoed. “Well, I think they will be useful for tourists, but when it comes either to technical stuff (and I’m not talking about aeronautical engineering or something of the sort, but about just a plain cooking recipe, for example) or to aesthetics (a play, for example), AI still has a long way to go before it produces decent results,” Vane Oritz said. Interpreters: They’re really, really helpful. Fears about machines stealing jobs are widespread, as technology and AI mean that everything from human truck-driving to legal clerk work is at risk of being made obsolete. Professional services firm PwCestimates that as much as 38% of American jobs are at risk of automation by the 2030s. And not everyone in the translation/interpretation industry is blasé about the potential risk to their livelihood. In technical fields (like court reporting), she predicted, the tech would reachable a usable state long before it actually gets adopted — but it will, eventually. “I think the technology will be available way before the courts will be willing to use it. There are due process and constitutional rights that must be protected, and the laws will have to change before machines can do our jobs. TRANSLATING VS. LOCALIZING GAME ASSETS, AND WHY DOES IT EVEN MATTER?